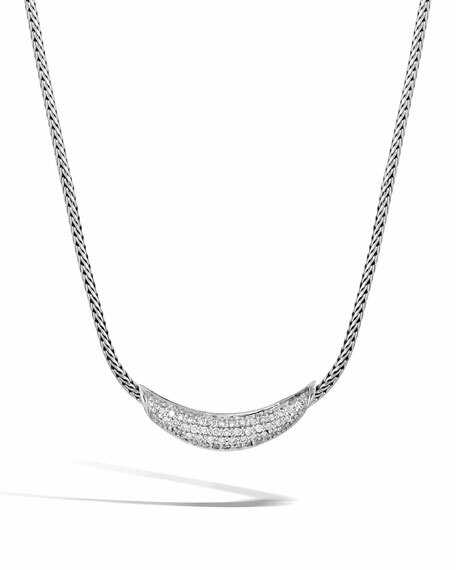 John Hardy Classic Chain Silver Diamond Arch Necklace, 18"
John HardyClassic Chain Silver Diamond Arch Necklace, 18"
John Hardy arch necklace from the Classic Chain Collection. Signature sterling silver hardware with woven chain motif. Integrated white diamond pavé center arch. Armenta enhancer from the New World Collection. Oxidized sterling silver. Blue Pietersite and white quartz doublet. Champagne diamond crivelli crosses. Armenta enhancer from the New World Collection. Oxidized sterling silver. Blue Pietersite and white quartz doublet. Champagne diamond crivelli crosses. 16.24 total Pietersite carat weight. 0.04 total diamond carat weight. Approx. 1.3"L x 1.3"W. Hinged bale attaches easily to chain (sold separately). John Hardy Bamboo Chain Necklace with Pearls, 36"
John Hardy necklace from the Bamboo Collection. Sterling silver chain. Naturally colored, freshwater cultured pearls, 11mm. Lobster clasp. Approx. 36"L.